“Katya”, charcoal and conte on paper, 45×35 cm, 2015, Svetlana Camera ASGFA. “Katya” is the first in the set of three portraits that Svetlana is creating for the girls’ family. “Most people believe that the hardest thing about working with children is to make them sit still. OK, that can be tricky, but is not as impossible as people think. The real challenge is to reveal the character of my young sitter and create a portrait that will make people see beyond the cute little face and feel that there is a deep inner world behind it. I feel I’ve managed to achieve my goal in this work”. At the beginning of 2015 the portrait “Katya” became a finalist in the ARC International Salon, one of the most prestigious international competitions for realist artists. In her drawings Svetlana Cameron uses the so-called “three-colour technique”, a combination of charcoal and red and white conte on toned paper, with occasional use of pastel for colour accents. The images are slowly and meticulously built up in layers of semi-translucent veils of colour, which allows the artist to create delicate life-like skin tones and achieve a very high degree of realism in her work. Svetlana Cameron ASGFA at work in her studio. 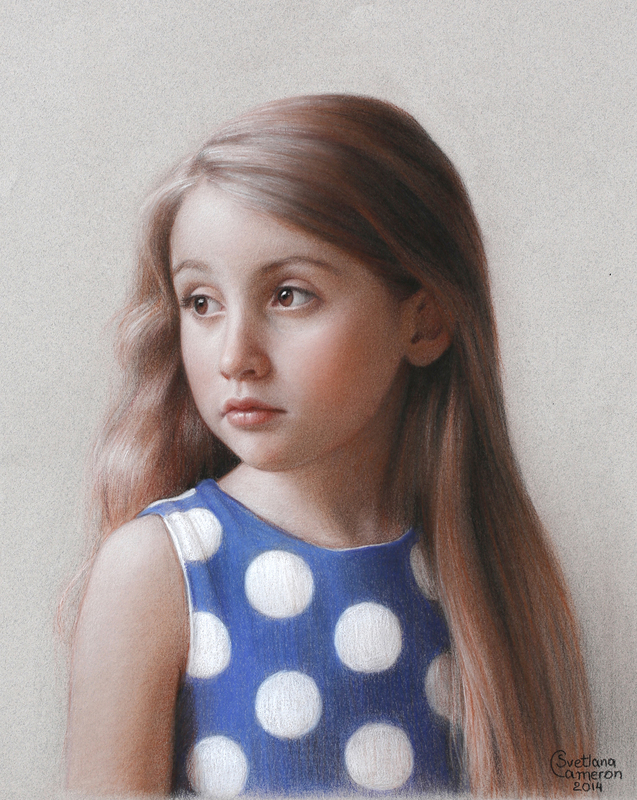 Svetlana Cameron (b.1978) is a Russian-born British portrait artist. Trained in the methods of Old Masters, Cameron specialises in traditional portraiture in the style of classical realism. She is based in the Isle of Man where she works out of her studio in Braddan. 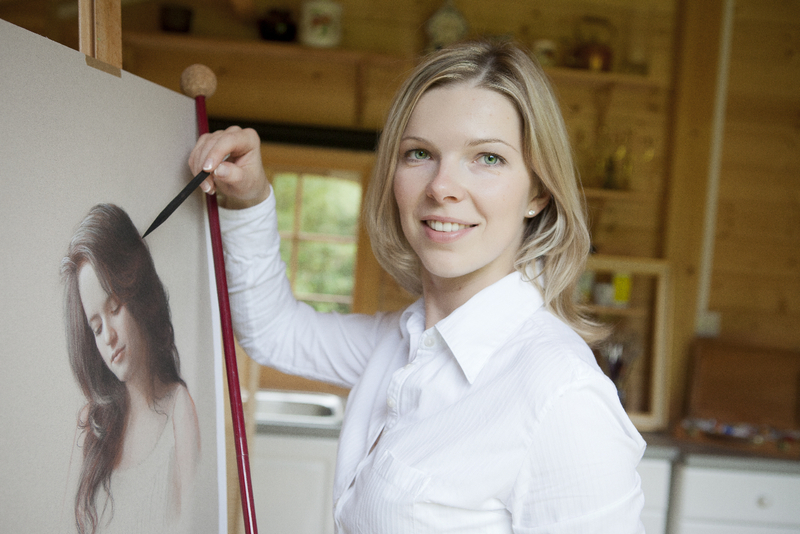 A sought-after portrait painter, she travels internationally to exhibit and meet her sitters. Svetlana’s works hang in many private and public collections. Her portraits of Speakers of the Isle of Man Parliament are now part of the UK National Collection of Oil Paintings and are featured on the BBC Your Paintings website. Svetlana Cameron was elected associate member of the Society of Graphic Fine Art in 2013. In September 2015 Cameron’s “Daniel” portrait won the Strokes of Genius drawing competition. Along with the other winning artworks “Daniel” will be published in the 8th volume of “Strokes of Genius”, a prestigious series of books featuring finest examples of contemporary drawing. It is Svetlana’s second successful participation in this annual competition: in 2013 her work “Girl with the Pearl Earring” stood out from thousands of worldwide submissions and was featured in the 6th volume of “Strokes of Genius”. “Stroke of Genius” is organised by the North Light Books publishing house in the USA. It is an annual art competition open to living artists from around the world. Each year around 100 works are selected to represent the best in contemporary drawing. Svetlana exhibited “Manx Folk Dancer” with the SGFA at Bankside in 2015, we are delighted to note that it is now a finalist in the International Artist Magazine “People and Figures” competition and will be published alongside an article on Svetlana’s drawing in early 2016. This entry was posted in Drawing in the Media, Image of the Month and tagged ARC International Salon, Competition, drawing, Katya, North Light Books, portrait, SGFA, Stroke of Genius, Svetlana Cameron. Bookmark the permalink.